Preparing smoked turkey legs can add flavor beyond regular cooking or baking. Smoking a turkey leg is a relatively simple process with the addition of a few materials and careful preparation. Smoked turkey legs can be smoked first and frozen for later consumption and is a year-round dish as opposed to whole turkeys used for the holidays. Prepare the brine for the turkey legs. Create the brine for the turkey legs by placing 1/2 gallon of chicken stock in a large pot. Add 1/4 cup of brown sugar and 1/2 cup of salt to the chicken stock and bring it to a boil. Stir the mixture to make sure the salt and brown sugar dissolve completely. Remove the mixture from heat and allow it to cool to about room temperature. Put the turkey legs in the brine. Just before you put the turkey legs into the brine, add a matching amount of ice cold water to the chicken stock mixture. This should be 1/2 gallon. In a large container or pot, submerge your completely thawed turkey legs into the mixture and allow them to soak for 8 to 24 hours, depending on their size. Larger drumsticks need to soak longer. Refrigerate turkey legs while they soak. Remove turkey legs from the brine after they have soaked. Rinse the turkey legs off with cold or room temperature water. After you have rinsed the turkey legs, season them with your favorite herbs and spices. To do this, you can use either a dry rub or wet rub (seasoning mixed with olive oil or vegetable oil). Heat your grill to anywhere between 220 to 250 degrees Fahrenheit. 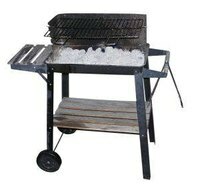 If you are using a charcoal grill, ensure that all the briquettes are on one side of the bottom of the grill. Wet half of the smoke-flavored chips you will be using to smoke the turkey legs; leave the other half dry. Wrap four individual packs of a handful of wet-smoke chips and a handful of dry-smoke chips in aluminum foil. Poke a hole or two in the packs so the smoke can escape easily. Grease the grates of the grill so that the turkey legs do not stick. Place the seasoned turkey legs on the side of the grill that is not over direct heat. Place one pack of chips into the flame or onto the charcoal briquettes, depending on the type of grill you possess. Allow the turkey legs to cook with the lid closed for about four hours or until they are 170 degrees Fahrenheit inside. Change the smoke packet out at least every hour. Change the type and amount of smoke chips used to produce a different or heavier smoke flavor. Use toothpicks to hold the skin of your turkey legs in place when smoking because it will shrink during the process. Always have a fire extinguisher handy when working around flames or outdoor heat.